Have you heard of Emily Schaller? Well if you have not, you should take the time to read about how this badass chick is changing the face of what it means to be diagnosed with Cystic Fibrosis. I first heard of Emily and her adventures through two mutual friends. As I was heading out on my own endurance sports journey, Emily was too. 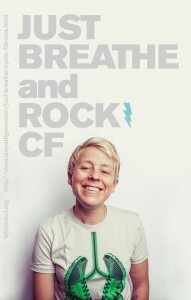 The only thing that was different was that Emily was doing it with Cystic Fibrosis. If you don’t know what CF is google defines it as “a hereditary disorder affecting the exocrine glands. It causes the production of abnormally thick mucus, leading to the blockage of the pancreatic ducts, intestines, and bronchi and often resulting in respiratory infection.” Yeesh, and you thought your shortness of breath was rough. Even with the disease Emily has dreamt big and achieved even bigger. Now’s your chance to get to know a superstar in her own right as she answers some of our questions! Two older brothers, it’s that easy. And a family that never let my diagnosis and prognosis of cystic fibrosis run our lives. Being told that I may not live long enough to graduate from high school is pretty brutal and I can guarantee my parents were pretty pissed when they were given the news in 1983. My parents let me do everything my brothers did. Skateboard? Check. Baseball? Check. Get beat up? Check. Listen to Warrant and Motley Crue? Check. The only difference was that I had to come in to take pills, do some breathing treatments, and get “beat on” a couple times a day to loosen that thick mucus in my lungs so I could cough it out. Aside from that we just lived and enjoyed every second like everyone else should. In 2013 I gave the commencement address at the high school I graduated from in 2000. What was the catalyst to say screw you CF and start racing endurance events? Plain and simple I was sick of being sick. When I first started “running” in 2007 I couldn’t even run a block. My lung function was in the 50’s, I was in the hospital 2-3 times a year for 3-5 weeks at a time treating recurring lung infections. After meeting a few people who were running I thought “I can do that too!,” but when I started I was literally the couch in the “couch to 5K” program. It took three or so months to figure out how to run 2 miles without dying. Once I did that I ran some 5K’s and 10K’s and then I ran my first 13.1 in 2008. I was hooked. In 2007 my friend and I started a fundraising ride from Detroit to Chicago. So that correlated well with my plunge into running. You’ve participated in a large variety of endurance events. Which one has been the most rewarding and why? 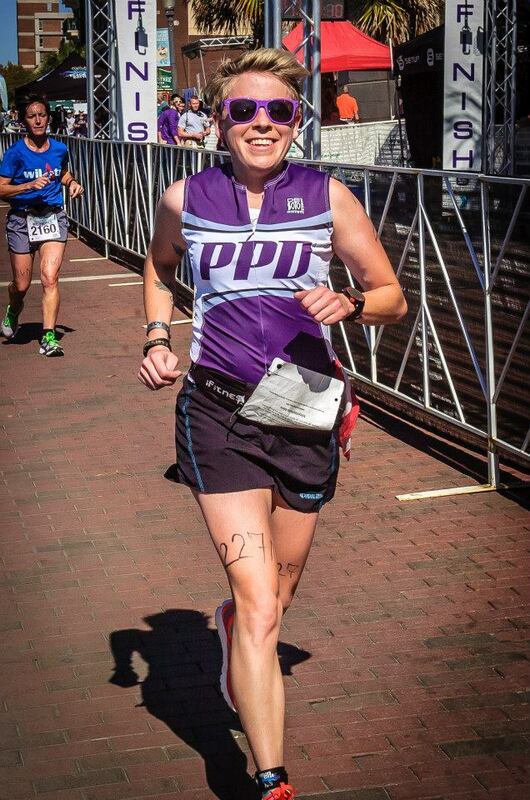 I love the PPD Beach2Battleship iron distance and half iron distance tri in Wilmington, NC. 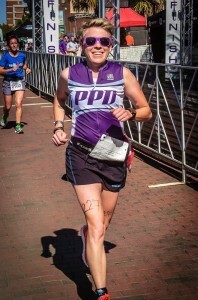 In 2012 I was invited to participate in the race as a “PPD Hero.” The coolest aspect of this race is that PPD (Pharmaceutical Product Development) uses their title sponsorship to inform and engage the racing community in what they do, manages clinical trials for these various diseases all over the world. By brining in 6 or so Heroes to participate in the race, we are all able to share how clinical trials have changed our lives. My fellow heroes are endurance athletes who are also cancer survivors, Type 1 Diabetics, have cystic fibrosis, or a host of other conditions. I’m a huge advocate for participating in clinical trials because I would not be alive today if clinical trials for CF didn’t happen. The most recent trial I was in has literally saved my life and given me a future that I never thought I would ever have. Back to the race, my friend who also has CF and I formed the relay team the Violent Phlegms. Scott did the swimming and I busted the 56 & 13.1. Finishing that race was such an amazing and emotional feeling. I had trained for months and months, figured out my nutrition, my fueling, and my salt intake, and then you only get one day to lay it all on the line and trust your training. Luckily it all worked! Days leading up to the race the Hero’s speak around the community, at the athlete dinner, on TV and on the radio. It’s amazing. Being on the course that day was the coolest though because as athletes would pass me (I never said I was fast) the would recognize me and offer some awesome encouragement. I was also able to talk with a few different groups of people during the bike portion and tell them about living with CF. I’ve done this race twice since and love it! Whenever I meet people who inspire me, I am always fascinated to know who inspires them. So who does inspire you? Ellen (obvious?) 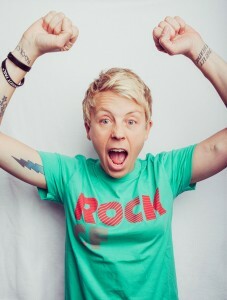 is a huge inspiration. Just from watching her show and reading more about and from her over the past 10 years, I have learned a lot about what it means to be myself and find what makes me, ME. Be who you are, love it and have fun. Be courteous and always be mindful of others. Life is too short and the world is too big to just worry about yourself. A smile and a laugh can do so much for someone. When I’m out racing I always keep all of my CF friends in the back of my mind. I save them for the hills, wind and when I just want to be done. They carry me through. I am big on goal setting and dreaming super big. I think that the creation of the Rock CF Half Marathon is a huge example of a giant goal that really impacts the world around you. So what is on your plate now, what is your next big hairy audacious goal? I’m glad that you gave the Rock CF Race a shout out! This was a dream of mine and the first year our goal was to have 200 runners. We ended up with 1,500! This showed me that you definitely should always dream big and shoot for the moon. Personally I would like to complete a “complete” half ironman. I’ve done 2/3’s of one. Sounds crazy but I grew up on an island and I don’t know how to swim. I can tread water but if you want me to move forward, I am out. So once I can master than I need to go 3/3 of complete the whole damn thing. On a personal and business level I want to be able to give every person with CF a pair of running shoes and get them working with their CF care team on an exercise plan. Some of my CF friends are already winning endurance races and biking thousands of miles a year, but we need to reach those who don’t think that they can exercise, or don’t even know how to get started. Rock CF wants to be that middle man! Exercise saved my life and I want others with CF to experience the benefits! Who is your rock? My rock(s) are my family, immediate and extended. Always there for me when I’m healthy, I’m sick, or to cheer me on at races. Who is your rival? Other than CF? During a race I always find someone I HAVE to beat. It usually involves someone in a costume. If you could be any animal what would you be? I love a good dolphin. Flipper always seemed so happy didn’t he? And he loved to help people. Favorite Meal: I’m a huge fan of breakfast. Breakfast for dinner? Even cooler. Favorite Race: The Rock CF Rivers Half Marathon, of course. Pets: No pets at the moment, but I love a good dog. Do you have any superstitions: Odd numbers for everything. Don’t even try to wake me up at 5:50am, it’s 5:51am..
FREE ASSOCIATION – what is the first thing that comes to mind when you hear the following? Penguin – I got to hang out with penguins this summer! One fell asleep on my lap. Water- 64 oz a day!